• The microporous volume of the adsorbent, where most of the stored gas is located. 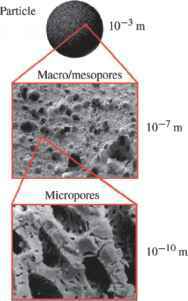 The density of the adsorbed gas in the micropores must compensate for the volume taken by the adsorbent and for the lower density of the gas in the void volume between particles and in the macropores and mesopores of the adsorbent. TABLE 3. Energy density of various vehicular fuels. Figure 2. Characteristic dimension of the various existing volumes in an adsorptive storage reservoir. • The packing density of the adsorbent bed, expressed in grams of adsorbent per cubic centimeter of storage volume. There are other characteristics of the adsorbent which are related to the operation of the reservoir. For example, the adsorbent must not break nor produce fine particles easily if subjected to long-term vibration conditions, such as when the vehicle is running. Since the fine particles are easily dragged with the gas during the discharge of the reservoir, they can damage various component of the engine. These operating restrictions reduce the range of candidate precursors for the production of carbons with high storage capacity and of activating processes to increase the microporous volume. Figure 3. Virtual image that shows the effect of mixing to efficiently pack a carbon bed: (a) carbon packing with a uniform particle size distribution; (b) carbon packing with a bimodal particle size distribution. The smaller particles are usually obtained by breaking and sieving the larger ones under controlled conditions. This process can increase the bed density by about 30%. • The compaction of fine carbon particles under the form of monoliths. The first method, is easy to implement and is very effective in practice . By packing particles with two different sizes, in the correct proportion, can increase the bed density by about 30% (Figure 3). The smaller particles are usually obtained by crushing and sieving in a controlled manner the larger ones. It is not advisable to employ multiple-size carbon beds because, although there is an additional increase of storage capacity, the smaller particles are too fine which may lead to operational problems. The production of monoliths, although it is technically more complicated, leads to the most compacted carbon beds . 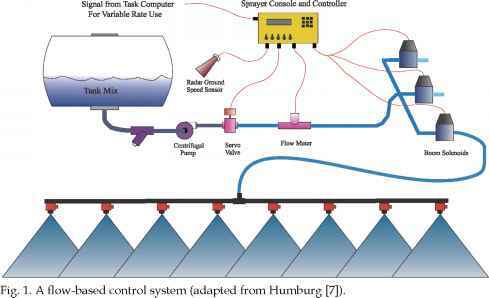 The procedure is basically that of mechanically pressing at high pressure (2,000 atm) a mixture of fine carbon particles with an aqueous solution of a binding polymer, and then removing moisture by heating. The monoliths are normally produced in the form of small disks with the same shape as that of the cross section of the reservoir. By superposing the discs it is possible to completely fill the reservoir.